I’ve mentioned quite a few times that Steve and I had a Drobo FS network attached storage device which was really slow, so we replaced it with a Drobo 5N. The 5N is also network attached but it has an accelerator bay, which accepts an mSATA SSD. This accelerator card caches frequently accessed data and thereby speeds up the overall performance. Steve chose a Crucial M500 120GB mSATA SSD for our Drobo 5N based on the recommended list at Drobo and we’ve been delighted with the speed of the 5N. Once the Drobo mounts, the speeds for anything short of video editing are fabulous. We’ve been humming along with that configuration since September of 2014, so about a year and a half. But this week we got a fatal error message from the Drobo Dashboard software saying that the accelerator SSD had failed.Steve went online to find a replacement card, and the newer model, the 550 from Crucial was running $128. He was ready to buy it when I stopped him. I’ve heard over the years that Crucial is a great company and stands by their products, so I thought it was worth a shot to see if they’d help us out. I know I sometimes really tease out the end of a story but I’d like to take a quick moment to explain what garbage collection is. I have heard about garbage collection a lot of times, especially from Dave Hamilton on the Mac Geek Gab, but I never heard a concise enough description for it to sink into my brain. I found an article on thessdreview.com/… written by Kent Smith, Senior Director of Product Marketing, Flash Components Division, LSI Corporation. LSI MAKES flash components so this guy probably knows what he’s talking about. I put a link in the show notes to the entire article that walks you through not only Garbage Collection but also TRIM, which I also don’t understand yet because I haven’t read that section yet! I’m going to give you a shortened version of what Mr. Smith explains in his article but I highly recommend reading it and looking at the diagrams that really help explain it better than I will here. There’s a big difference between spinning hard disk drives and solid state, or flash, memory. With a hard disk, if you change some data, new data can be rewritten over the same location on the disk. Solid State Drives, or SSDs, cannot do that. Instead, they leave the old data in place and write to a new location. Garbage Collection is the process of cleaning up that old, invalid data. Sounds fine, you’ve got your garbage collector sweeping up behind at all times, right? But that’s not quite as easy as it sounds. Flash memory is divided into blocks, which is further divided into pages. Data can be written to any empty page, but only whole blocks can be erased. If you’ve got some invalid data and some valid data in the same block, the invalid data can’t be erased from the block until that valid data gets moved to another block. Only then, can the old block be erased, allowing new data to be written to the pages in that block. This process is called Garbage Collection. You can see why if the Drobo is never giving the SSD down time to perform Garbage Collection, that the SSD would eventually become corrupt and unusable. Ok, now back to our story. I was pretty happy that Crystal knew all about the Drobo’s use of the mSATA SSD and knew what was wrong, and more importantly how to fix it. I thanked her and signed off. I went over to the Crucial knowledge base article she’d sent me to read up on how to fix the problem. Turns out the basic process to allow the SSD to perform Garbage Collection is to hook it up to a Mac or a PC and let it sit idle without the computer communicating with it. They said to boot the Mac into startup disk mode by booting up with the option key down, and then to let it sit for 6-8 hours. Luckily I’ve got an 8 year old MacBook lying around that I could just leave idle for that long! That was all well and good, but I would need a way to hook it up to the Mac. I do have a Universal Drive Adapter that I thought I could use. I love this thing because it lets me hook up 2.5 or 3.5″ bare SATA or even IDE storage devices to my Mac without messing with enclosures. I also like it because it’s like a puzzle and fun to try to remember how to put it together each time. There’s a little black plastic piece that has all kinds of connector holes on it. It comes with a SATA cable, a power cord and transformer, and an IDE cable. It’s an adventure in logic to piece it together. 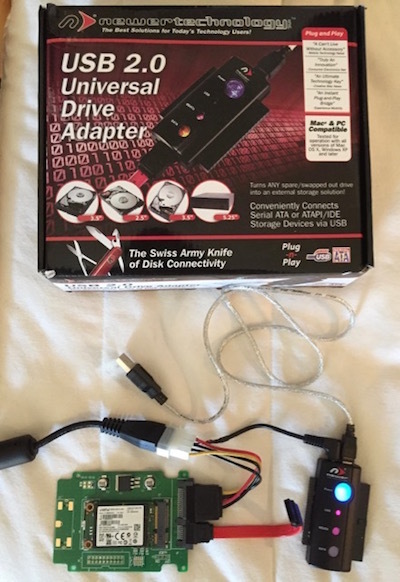 Unfortunately I wasn’t to have that adventure because the SATA cables wouldn’t connect to the mSATA connectors, they were too small. I got back on chat and was delighted to get Crystal a second time so I didn’t have to explain everything again. I told her that I didn’t have an easy way to hook it up to my Mac. At first she explained that they don’t support the use of their SSDs in Drobos. This was curious because, as I mentioned, Drobo recommended their SSD. The good news is that Crystal said she’d send me a replacement SSD anyway because it was under a 3 year warranty. I’m glad she did the right thing because I would have been just a tad annoyed if the warranty had not been honored. We were going to have to wait for a few days for the replacement mSATA SSD to be sent to us. 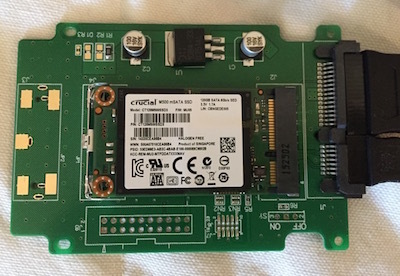 Steve and I got real curious about whether this really was a Garbage Collection problem, so Steve bought a little circuit board for under $10 that works as a carrier for the mSATA SSD, and then has a standard SATA connector on it. I did my little puzzle with the Universal Drive Adapter and I was able to plug it into the spare MacBook. I followed the instructions to boot up into startup disk mode so it got just power for 9 hours. Unfortunately when I put it back in the Drobo, it still reported a fatal error. However, when we got the replacement SSD from Crucial, we popped it into the Accelerator bay on the 5N and it worked instantly. I enjoyed this because a) I learned that Crucial’s support is as good as everyone says, b) I finally learned what Garbage Collection means, c) I got to play with some circuit boards, and d) the whole thing only cost us $10. The only problem is that we’re left with lingering doubt about what actually happened here. Did the drive fail because of a lack of Garbage Collection or not? Will our shiny new drive fail in a year or so as well? could you erase and reformat the old mSATA SSD and reuse it somewhere? I have a 5N but never went the SSD acceleration route. Do you recommend it? Is it worth the heartache? It sounds like this Garbage Collection is a process best avoided. I don’t mind spending the bucks for the SSD, but I certainly don’t want to live in the world of all you’ve been dealing with. I am posting more than you may want to know about Crucial SSDs on Allison’s Google Plus Community. Barry. it just Occurred to me that reformatting probably wouldn’t work, if GC really is the problem. Writing Ones and zeroes might not even do it. Kenny, in a year and a half we had a drive failure So not a big nightmare here. Drives fail, right? If your 5h feels fast to you, and you can work on files across the network (gigabit) then I don’t know if you need to. If I could think of a timing test that we both could do that would prove it it’s worth it, I’d do it. I agree, its probably not worth it. 99 percent of what I’m doing is backing up devices from around the house. No “need for speed”….other than knowing its out there and wanting it! I know I am super late but if anyone needs this information, here it is. Garbage Collection and TRIM do not work over USB. Wow – you just saved me a load of time. I was thinking of trying to hook up my 128GB plextor m.SATA accelerator SSD (which is giving 100% warning – according to Drobo Dashboard) to a USB controller to see if it could somehow recover its health through the garbage collection. Instead I’m just going to insert a larger capacity m.SATA (240 GB Kingston) to see if it lasts 6 years instead of 3 of the original. With SSD costs falling so fast, I think lack of GC on Drobo may become an irrelevance….Alternatively, if Drobo did their homework (if it really is a problem), why couldn’t they recommend scheduled shutdowns every 3 months and have the system perform this step (GC) at boot time?